Perfect for office buildings, arenas, hospitals, theaters and shopping malls. This contemporary perforated design provides any area with an upscale look. Lid options include flat or hood top for 35 and 55 gallon receptacles, and a dome top lid for 55 gallon only. 35 and 55 Gallon Capacity. Three Stainless Steel Leveling Feet Included. 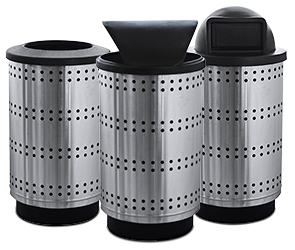 Each trash receptacle comes standard with a black high density 100% recyclable plastic liner, encapsulated lid security cable, ground anchor kit, 3 stainless steel leveling feet and 2 anchor tabs with anchor kit. The bottom ring is dipped in corrosion resistant plastisol for added durability.